Delteil 16 v/v; Shapiro 161 vi/vi. Softground etching and aquatint with touches of drypoint on thin laid japanese paper. Edition of 50, intended but never issued in Le Jour et la Nuit. 8 5/8 x 10 1/2 in. This etching was executed for a project conceived by Degas, an Impressionist print journal to be titled Le Jour et la Nuit but never brought to fruition. It is an important experimental print that uses soft-ground, layers of aquatint brushed directly onto the plate, and scraping in a highly innovative and inventive way. In a fascinating series of successive proofs, the layers of aquatint duplicate dense brushstrokes to produce a kaleidoscope impression of landscape. 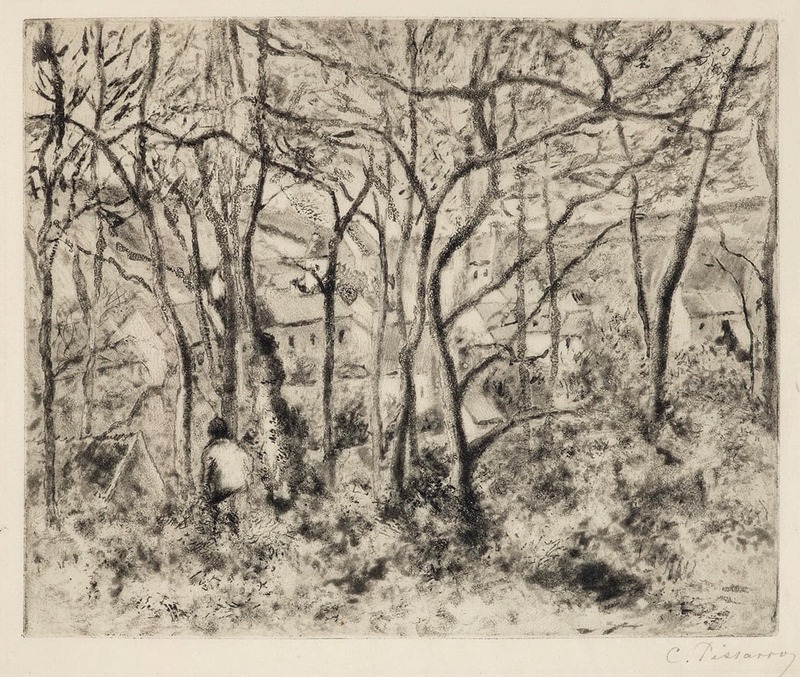 This “painterly” print is perhaps the most renowned etching by the artist and quite rare.